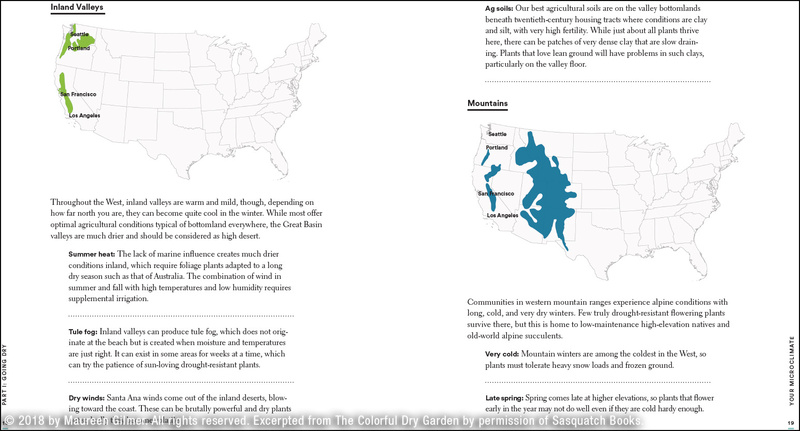 For those of us gardening in the western U.S., water—or rather the lack of it—is always on our minds. The 2011-2017 drought in California was a wake-up call for many. Even though Governor Jerry Brown declared the drought to be over in April 2017, the minimal rainfall this winter is a painful reminder that drought may be the new normal. Cape Town, South Africa running out of water raises the specter of something similar happening here. While that's not likely (yet), we should still do our best to be as water-conscious as possible. Homeowners wanting to making their landscaping more drought-tolerant often feel like they're trading in a vibrant garden for a sparse and monotonous expanse of brown. Worse yet, some simply give up altogether and cover what used to be their yard with bark or gravel. I see depressing examples of that right here in our town. But it doesn't have to be that way. 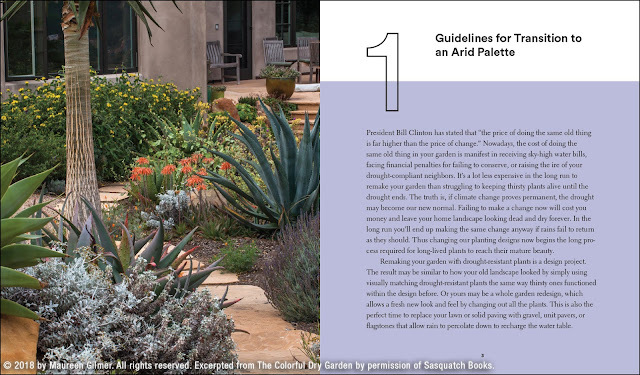 In her latest book, Palms Springs-based landscape designer Maureen Gilmer shows that there are far better alternatives. The Colorful Dry Garden: Over 100 Flowers and Vibrant Plants for Drought, Desert & Dry Times (Sasquatch Books 2018) aims to make "your garden alive with flowers and color, with birds and butterflies, so that it changes with the seasons and yet asks for few resources." As a horticulturist and landscape designer, Maureen Gilmer has been in the trenches for a long time. In the introduction to The Colorful Dry Garden, she says she's been making plant lists for over 30 years. 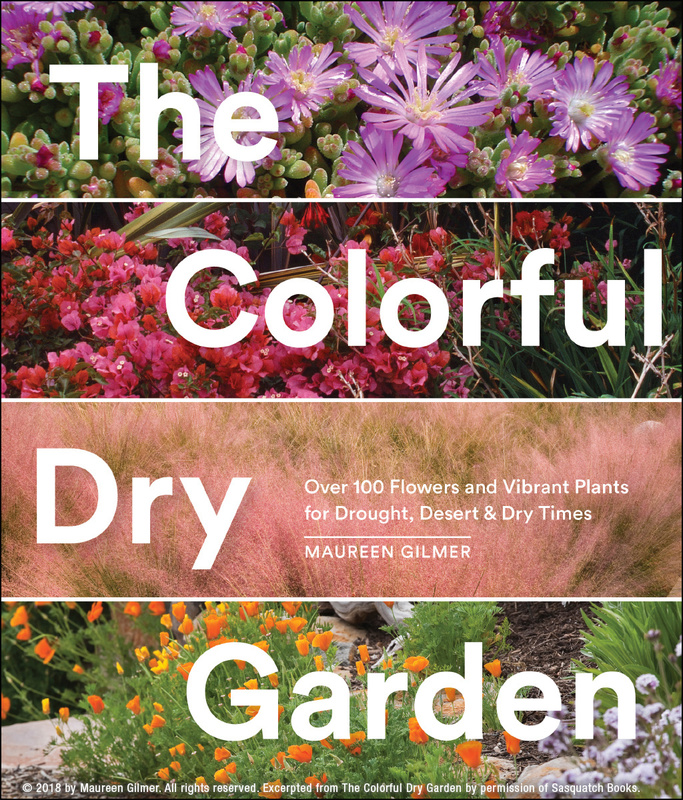 This book "evolved out of all my lists for color in desert and other arid climates that make the perfect palette for those working to overcome drought with a beautiful, floriferous drier garden." By sharing her knowledge, she wants to empower readers to pick "the right plant for the right space." 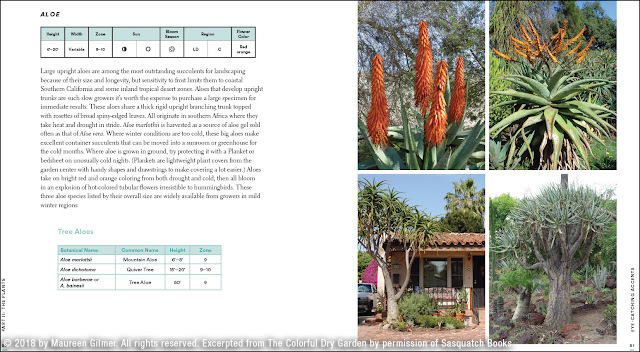 Part I of the book (chapters 1 and 2) helps you transition to a more water-wise plant palette. 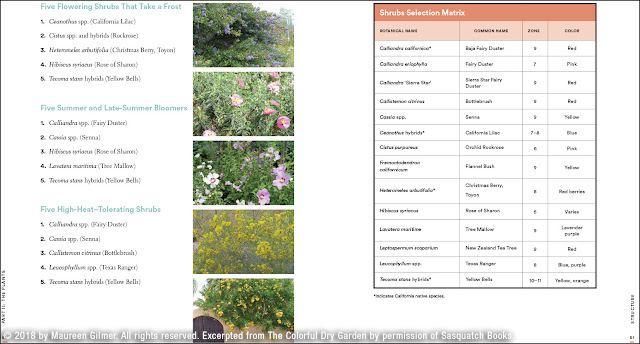 Depending on the kinds of plants you have now and what your goal is, you may be able to simply replace thirsty plants with visually similar drought-tolerant alternatives. Or you may want to start from scratch and build a new garden from the ground up. Maureen Gilmer lays out the process in easy-to-understand steps, from identifying the degree of change and site assessment to plant selection criteria based on your hardiness zone. Maureen describes the climate zones in the West in great detail. This will help you understand what challenges you're faced with and, hence, what plants will do best in your area. This may not seem like a big deal to more experienced gardeners, but it can be an eye-opener to homeowners who don't spend every waking moment about their garden. The “meat” of the book is section Part II: The Plants. 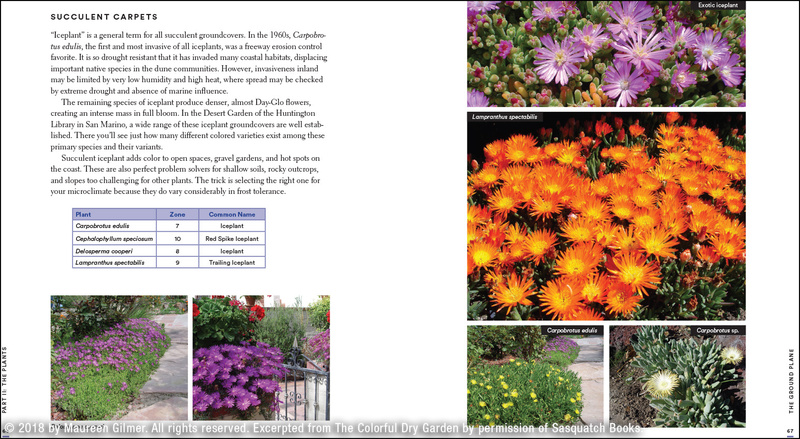 Eight chapters are dedicated to different types of plants that play a variety of roles in the garden—from groundcovers to shrubs to trees, and from seasonal flowers to perennial color to edibles. 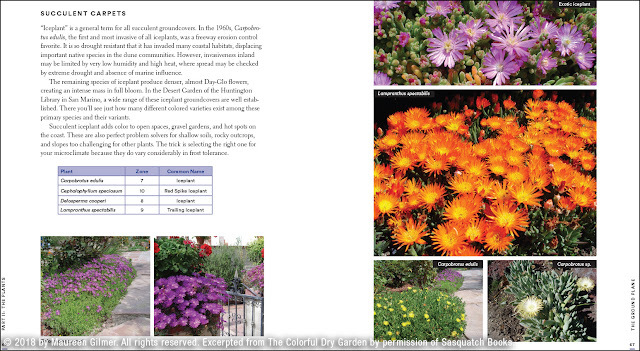 Each chapter has portraits of Maureen's favorite plants in the respective category, complete with information on height and width, hardiness, preferred exposure (sun/shade), bloom season, flower color and the climate region the plant is best suited for. The selections in each category are summarized in a handy chart at the end of the chapter. ...under "Eye-catching Accents," and under "Grass-like Plants." In addition to plant details, the various chapters also contain useful information on hardscape materials, how to light accent plants, tips on sowing wildflower seed, and planting on slopes. Possibly the most surprising section for me was Chapter 10: Dry and Edible. I'm predominantly an ornamental gardener, and while we have several raised beds for vegetables in the backyard, we haven't used them much in recent years because of the added water many vegetables need. I found Maureen's recommendation in the Dry and Edible chapter very interesting. They range from trees that get by with little water (fig, pomegranate, bay and olive) to unusual edibles that are also attractive as ornamentals (globe artichoke, grapes, natal plum, apple cactus, dragon fruit, prickly pear and Japanese rose). 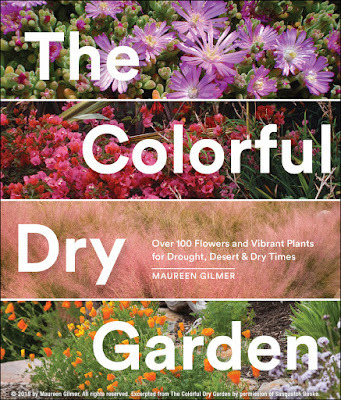 Maureen is an expert in this area, having written an entire book on this topic (Growing Vegetables in Drought, Desert & Dry Times, Sasquatch Books, 2015). There is a wealth of information on water-wise gardening scattered all over the Internet, but much of it is fragmented or lacking in detail. Maureen Gilmer consolidates everything you need to know to get started based on her 30 years of experience in the field. The Colorful Dry Garden is concise but it covers all the basics without overloading you with superfluous or irrelevant information. It's the perfect resource for folks who may not be hard-core gardeners but want a beautiful yet unthirsty garden all the same. Note: Sasquatch Books provided me with a review copy of this book at my request. Page spreads and photos shown above © 2018 by Maureen Gilmer. All rights reserved. 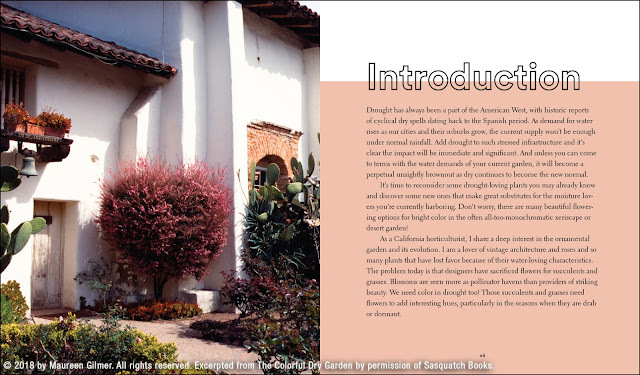 Excerpted from The Colorful Dry Garden by permission of Sasquatch Books. Thanks for this review! I've been transitioning certain beds of my garden into dry beds that I can water less, so that I don't have to spend my entire summer dragging sprinklers around, and I'm always looking for new ideas for what to plant there. Despite our reputation for drowning in water, we do have those dry summer months to deal with here in the PNW. I noticed the graphic you showed above does include Seattle, which leads me to hope that the book is not Southwest-centric. Alison, the climate zones cover the entire West Coast. The Seattle/Tacoma area is under "Inland Valleys." Obviously you don't get quite as sizzling as we do, but I was surprised by how hot it *can* get on our trip to the PNW three years ago. I collect pretty much every book on gardening in dry conditions that I can find. I hadn't heard about this one, however, even though I'm familiar with Maureen Gilmer. I'll be ordering a copy soon!